A nation is much more than a zip code or a place to visit. A nation is much more than an accumulation of people standing around in a shared geography. A nation is an accumulated inheritance of its past, a large aggregate of people united by common descent, history, culture, or language, inhabiting a particular country or territory. 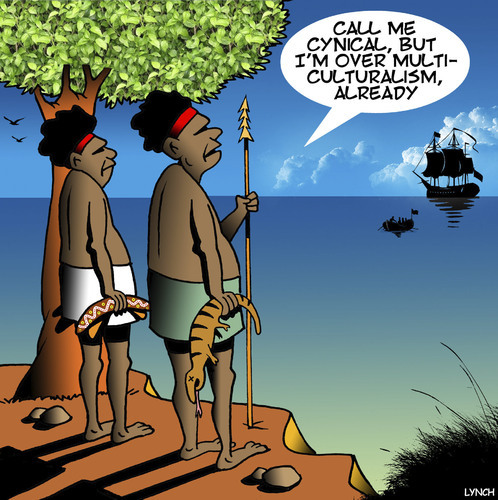 culturization process. Taking this one step further only those countries that reach a certain economic level and freedom are targeted for multiculturalism. When an internal or external force demands that a nation change its national status by introducing a cultural upheaval, that nation is committing suicide. The act of forcefully changing the demographics of a nation changes that nation beyond the will or natural forces of its members, negating their will and national identity in the process. Many nations have undergone cultural changes without loosing their national identity, the United States is one of them. Through the process of cultural diffusion many cultures can integrate into a thriving national system without crashing the system that welcomed them. For over 200 years the American process of enculturation has provided the means to become American without loosing there own cultural identity. Germany accepted the entire East German population back into its ranks. The process was difficult and costly but the integration was successful due to the shared cultural identity of those being allowed back in. Even for those who do not immediately share cultural history or language the integration process is possible when the immigrants agree to the overall cultures and practices of the host nation. Any other process, any other culturalization proves to be ineffective and damaging, as can be seen in France, Sweden, Great Britain, Germany and other European countries that allowed mass immigration from countries that have no interest in accepting the offered nations culture. Multiculturalism demands that the foundational process of enculturation be abandoned and dis-guarded, replaced with a more socialistic brand of segregation that promises utopia but delivers misery, discord and chaos. The subsequent cast system is blatantly socialistic or in the terms of Islam, Theocratic and brutal. I want to make my position clear, this is not about immigration. Immigration has worked well for over 230 years, with a major portion of our population immigrating to the US. The difference is in the process of how they immigrate and the need to curb the destructive Multiculturalism that is currently being called for as a guise toward helping those who are less fortunate or in dire circumstances due to war or political pressure. There were roughly 2.6% of East Germans who had to be integrated and the cost of that integration has been in excess of 1.7 trillion dollars and these were Germans who were coming home. In Sweden the population percentage is proximately 6% with England 5.5% and France between 7% and 9%. Again, this is not about immigration this is about Multiculturalism and the open and forceful destruction of Nations for political ends. No country can be expected to successfully integrate an incoming and radical population without dire consequences and loss of National identity. Germany had a very difficult time integrating its own population after 50 years of communist rule. These were Germans who shared the same history, the same foods, stories and language and dreams. When none of those similarities are present there is not integration, it’s more like an invasion. Similar in part to the United States and its southern border with Mexico, except that within these areas we have a shared culture, a shared language for many and a shared belief in Christianity. But still, left unchecked the border was being overrun and the issues of Multiculturalism began to take place over the immigration designs of the host country. Immigration is good, needful and practical based on the individual needs of the host country. Multiculturalism demands open borders, massive immigration by un-veted and potentially dangerous elements from areas not necessarily friendly to the host country and done primarily for political reasons and not for the Nation or its people. We need to take a closer look at the demands of those who scream and demand for Multiculturalism. These voices are harsh, shrill, damaging and only motivated by ignorance or politics. Our Nation is strong and resilient but it wont stay that way if we let these radicals move us away from a rational immigration policy.